This past weekend I tried a little experiment for brunch and it turned out wonderfully. If you’re an egg lover and looking for high-protein, healthy breakfast or brunch options, I highly recommend this one! It’s super easy and equally tasty and only requires a couple eggs and veggies, cheese or other toppings/fillings of your choice. ***Additional ingredient ideas: green onions, chorizo, olives, cheddar, bacon, spinach or whatever you’re in the mood for! I placed all my ingredients of choice in a small oven tray/pan about 5 inches in diameter and 1.5 inches deep. 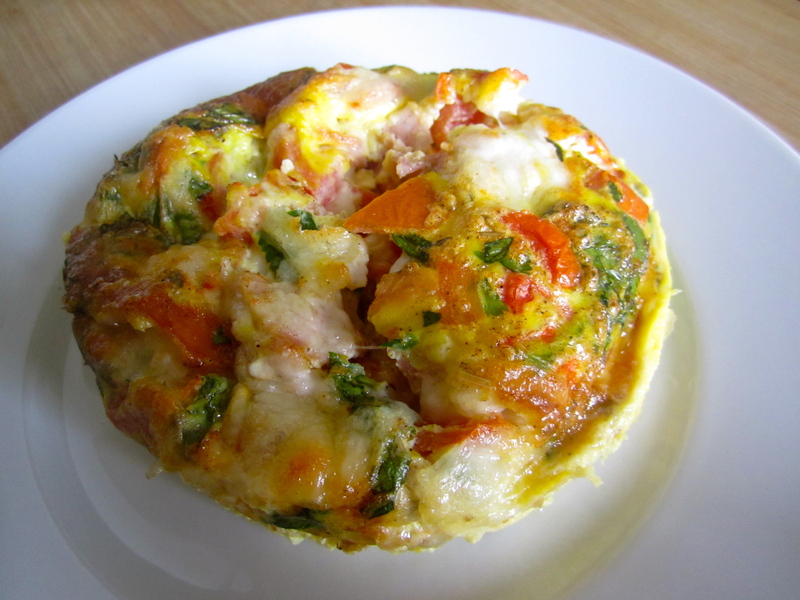 (The circular egg quiche looking thing that is pictured as the featured image is on a small white serving plate, not a standard dinner size plate). I then poured the scrambled egg mixture over all the ingredients and baked it in the over for about 25 minutes (or until golden brown) at 200C degrees.